Transcript Requests lets you field and process official transcript requests from your students. Current students go to their My Profile > Student view and click Request Official Transcript (an academic staff user can also do this on their behalf). Alumni and past students without a login can visit the public form and request an official transcript that way. In the request form, they specify the request details and transcript recipient—and if required, they pay for the request by credit card (you can also charge it to their account, in which case the charge must be invoiced and paid). The request appears in the Transcript Requests report. From there, you fulfill the request. These settings govern how you and your students will use the transcript request features. Whenever you update one of these settings, make sure to scroll back up and click Save Settings! Enable official transcript requests: Checking yes enables your students to request official transcripts (and you to fulfill those requests). You'll see the URL for the public form here. A link to get an embed code will appear under the Save Settings button. You can enter custom CSS to make the appearance of the request form match the look of the page in which you're embedding it (see below). Print/mail: Sends the transcript (and an envelope or mailing label) to Communications > Print Queue. Email: Sends a PDF of the transcript to the recipient's email address (with optional encryption). If you enable web transcripts, the emails includes a link to an always up-to-date electronic version of the transcript. Charge method: You can charge the request fee to the student's account or you can require the requester to pay immediately with a credit card. Charge to account lets current students charge the request to their accounts. All other requests—particularly those made using the public request form—will be paid by credit card. Credit card requires all requests be paid for immediately by credit card. Select None if you do not wish to charge for these requests. Default fee: Select the appropriate fee you'll use to charge for transcript requests. You can over-ride the default fee/amount by creating a fee rule (see below). Send transcript request notification emails to: Search for the people whom you wish to be notified when a student requests a transcript. This field lets you select any Staff user; we recommend limiting the recipients to Academics users with access to the Transcript Requests view. Transcript request form custom CSS: You can embed the request form in another web page. Copy-paste CSS in the text area to give the page a similar look and feel to the website in which you're embedding it. You'll also want to visit Academics > Settings > General to enable web transcripts (if desired). Students can request an official transcript be delivered by any of the methods you set up. Delivery methods come in two flavors, which affect the workflow you use to fulfill them. Printed transcripts culminate in some kind of hard copy; Emailed transcripts generate a URL the recipient can use to view and download a PDF. Give it a name; this should double as a brief description that will tell the requester what he's asking you to do (Print and Mail, Overnight, Carrier Pigeon, etc.). Select the workflow—Print or Email. After creating a delivery method, you can link it to a fee rule (see below). If you need to delete one, click . Fee rules let you charge different amounts for particular types of transcript requests. For example, you could charge $5 for an emailed transcript and $10 for one that's printed and mailed; or you could charge specific amounts depending on the academic program. 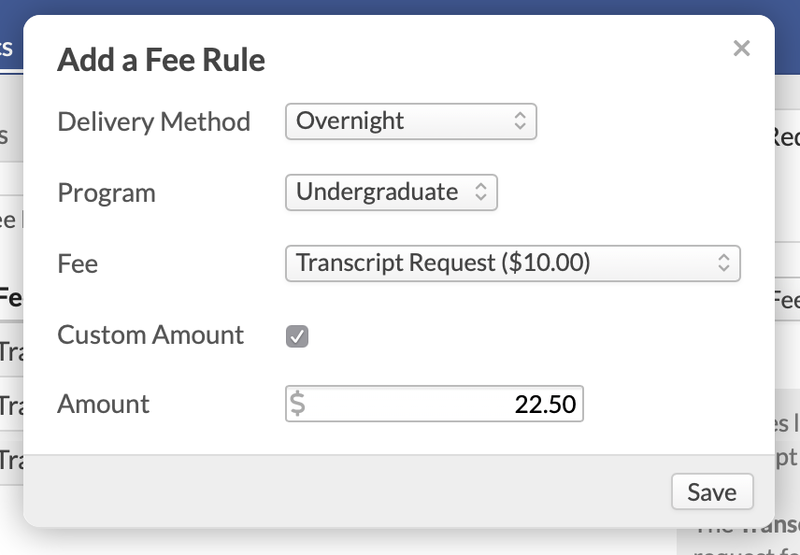 Fee rules let you over-ride the default transcript request fee and amount. Think of transcript fee rules as a behind-the-scenes filter that determines what a student's transcript request will cost. If the transcript is to be printed/mailed and is for the Graduate program, it will be charge this fee/amount. Click Add a Fee Rule. Select the fee you'd like to charge for these particular requests. You can select any fee you wish, but you should probably choose a fee created for this purpose as opposed to, say, the Parking Ticket Fine fee. Check if you want to charge a custom amount—that is, a different amount than what is listed for that fee's amount. For example, you select the default Transcript Request fee of $10 and enter a custom amount of $5 for this fee rule. Now that you've created this fee rule, transcript requests that fit its parameters exactly will be charged the different fee/amount you specified. Edit a fee rule by clicking its name. Delete a fee rule by clicking ; doing so will not affect any previous uses of this fee. Now that you've completed setup, you're ready to start fulfilling transcript requests.